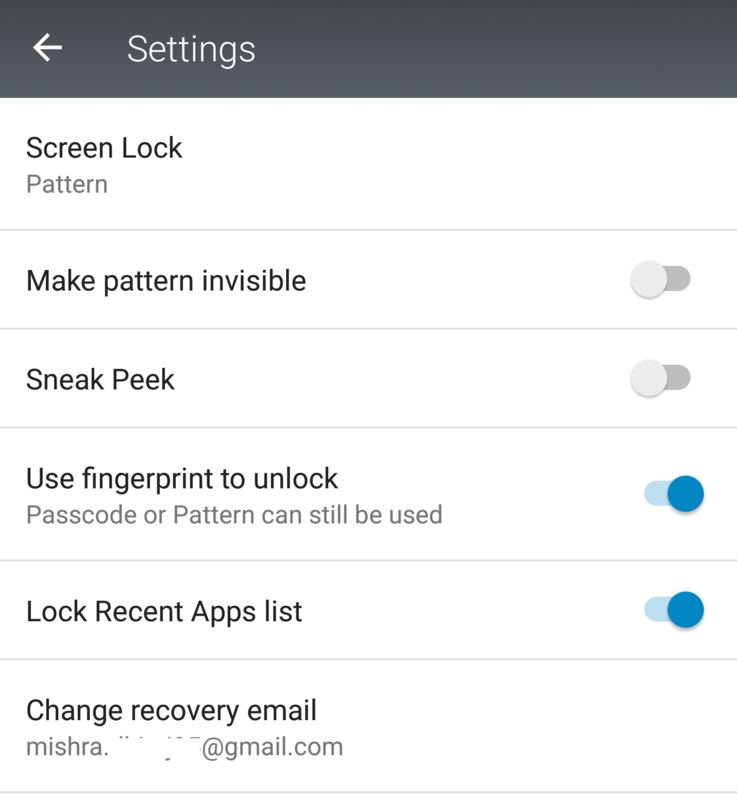 Summary: The inbuilt applock of Dr. Safety can be bypassed locally by saying "OK Google" and then viewing the activity pane, which was left unpatched by TrendMicro. After finding Same Origin Policy Bypass in Trend Micro Dr. Safety for Android (Consumer), I started digging more on this application. It also has a feature of applock which enables users to lock their respective applications via secure pin or fingerprint. This may not be a great bug because only a local attacker can exploit the issue, but the steps to reproduce this issue was innovative (personal opinion). 2. 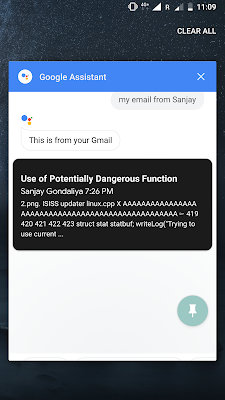 Once all applications are locked by Dr. Safety app lock, Say OK Google. (Assuming your OK Google service is also locked it will ask for pin or pattern). 3. But continue saying such as "My emails from Sanjay"
4. 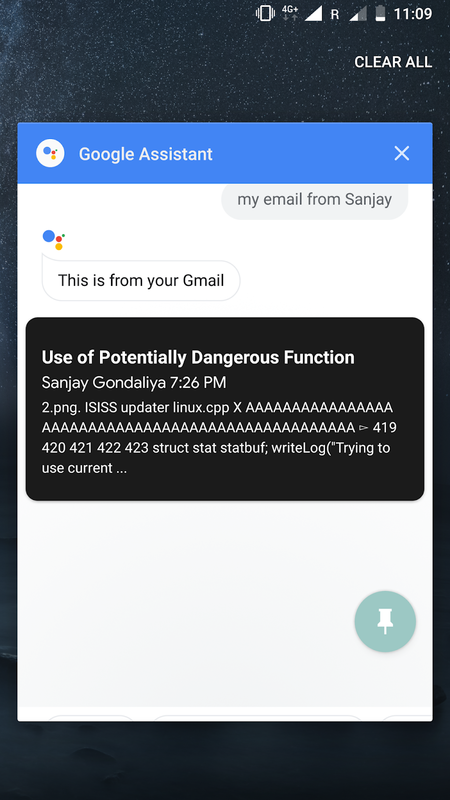 In background "OK Google" replies "This is what i found ...." (However, still we cant see the data because Dr. Safety app is asking for pin/pattern #Step2). 5. Now, just try closing that window by using activity pane. (Which actually allows you to close all running apps). 6. Bingo! In app preview you will see the glimpse of email from "Sanjay" or Mr.XYZ. Below PoC for reference. I believe from a malicious attacker's perspective, the application still fails to prevent exposure of other applications which are being locked by Dr Safety, thus leaking such confidential information, which in my opinion is a concern. I went ahead and spent some time by analyzing the APK file and found AppLockMain.xml file can be responsible for this issue. As a recommendation, I can suggest that when the user accesses the activity pane using the hardware/software buttons on the phone, the Dr. Safety app can detect if it's running in the background and use a screen overlay of it's own to mask the other applications which are being display in the activity pane. and guess what? there is an alternative app in playstore which also locks the recent app list (activity pane) in the same fashion which i mentioned above. 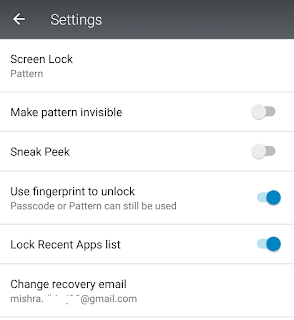 So Norton App Lock from play store allows users to lock their activity pane also in such case the above attack scenario will be failed. * User could easily clear all recent activities. * On Android 7 and above, users could easily dismiss the ‘draw over other apps’ in status bar, so the page blocked ‘Recent’ will be dismissed. Thus, we could not provide this enhancement efficiently. I hope you like the read. Candy crush amount 14-9 makes unite five candies. The level Is called post-secondary level. As a result with the level create lettering contours. Usually, 3 or even more candy made combine and clear them. But when you create unite 5 or even more candies, you get extra things. Thus this can be very useful and quite effective at the degree. Level 149 make plus, L or T contours with five sweets. Make Plus shapes together with five candies and get more things. And also you make L contours and get more points. If you also make T shapes you receive a great deal of point and benefit. You will get 200 points. It is very different degree in candies smash games. Within This stage, the Key objective is to eliminate all Chocolate quickly. Only 3-5 goes or less you rid each of candy. If you do not satisfactorily use within 3-5 moves, then you are going to eliminate this level. This amount your task will be to make 10 striped and make Wrapped together too clear ninety nine blue candy. Creating mix wrapped and wrapped together is more also complicated. Practice how the candies each time having a go. When you've wrapped wrapped candy, your match becomes more , and you also make one by one such as ten minutes. If you create a substantial sweet candies, alternatively of you lift a substantial amount of candy candies. To begin with, your aim will be 30000 factors. You may struggle for 320000 points for one star. Then your vacation destination is going to be 90000 things for 2 stars. When you heat the target last but not least your target will become 120000 points for a few celebrities. It is the cheapest within the degree. Therefore, if you pass this degree, you should attain 120000 points. So, candies crush level 149 suggests a challenging amount. Should you Stick to the strategy, the degree becomes much more normal. Thus delight in this game. Qu:- what is total issues in level 149? Ans:- at level 149, the complete purpose is 120000. Qu:- How how many blue candy would have accumulated? Ans:- three are 99 blue candies would have collected. Qu:- Do I use my booster for candies crush amount 149? Ans:- yes I should use all booster that on your arsenal.